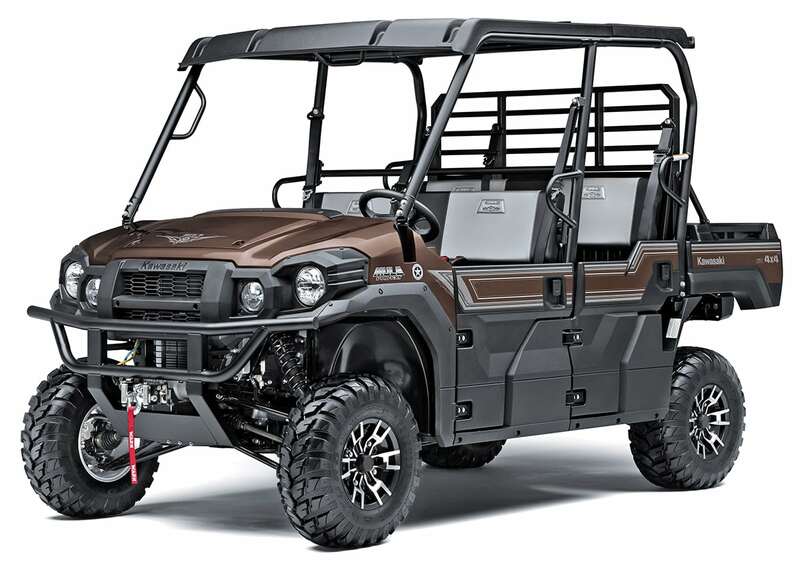 For 2019, Kawasaki continues to expand its lineup of refined Pro Series utility recreation UTVs with the new Mule Pro-MX, and the Teryx line gets new looks. Here’s what you need to know about the new arrivals. 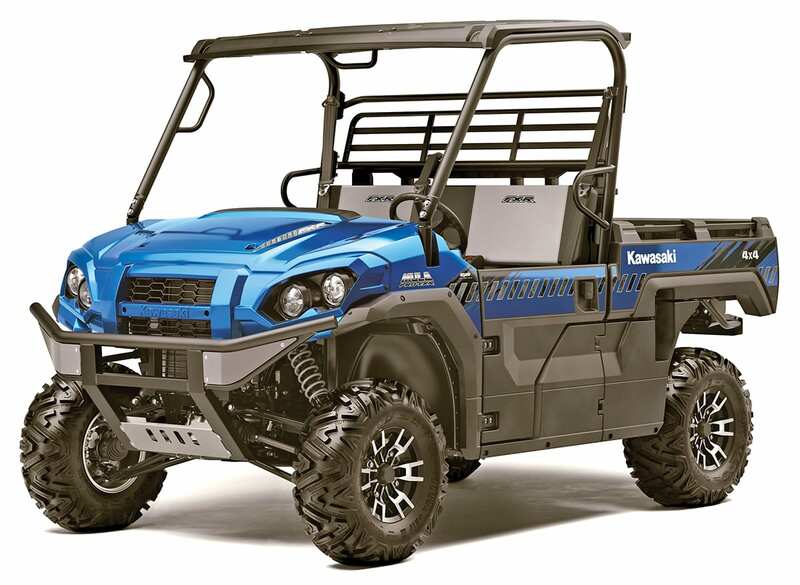 Kawasaki’s new Pro-MX is a 60-inch-wide, two-seat vehicle that’s more maneuverable in tight conditions than the larger 64-inch-wide Pro Series Mules. 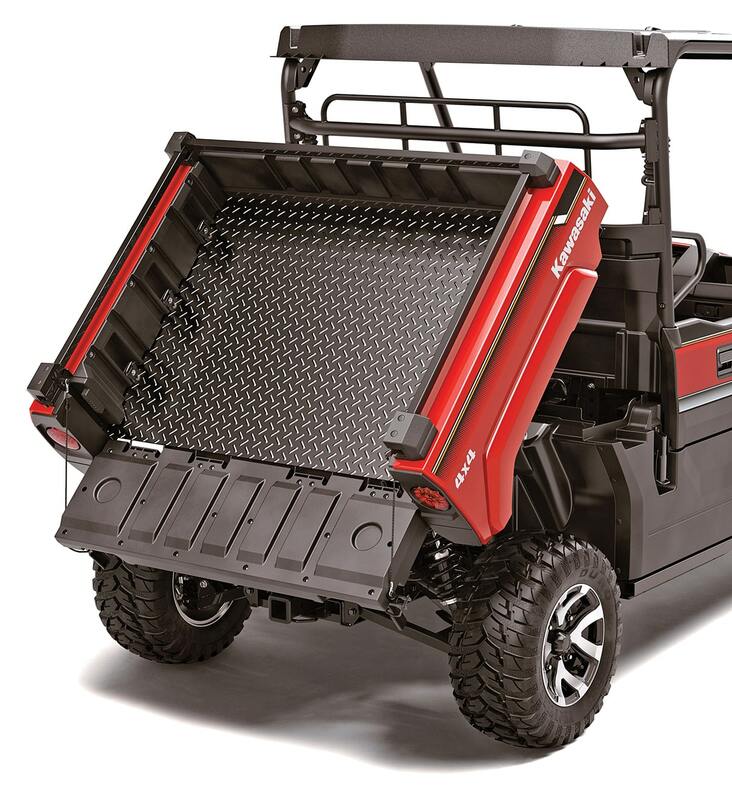 The new Mule Pro-MX is a smaller, narrower (60 versus 64 inches wide) vehicle than full-size Pro Series Mules with seating for two rather than three or six. It’s powered by a single-cylinder, 695cc, single-overhead-cam, four-valve engine rather than the 812cc, three-cylinder engine used in the larger models. Its fully automatic, dual-range continuously variable transmission includes automatic engine braking. 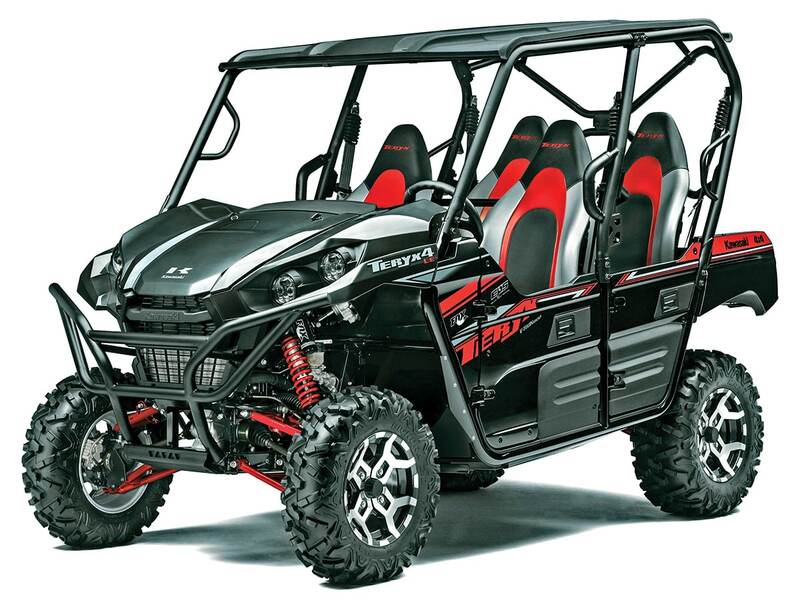 Pro-MX Mules are powered by a single-cylinder, 695cc, single-overhead-cam, four-valve engine. Base, LE and camo versions are available, and all have power steering, selectable 2WD/4WD, a lockable rear differential and four-wheel disc brakes. The SE comes with painted bodywork, aluminum wheels and a roof. The camo model has a roof and steel wheels. The base model has steel wheels and no roof. Double-A-arm front and rear suspension features spring preload-adjustable shocks. The tilting cargo bed can carry 699 pounds, and the vehicle can tow 1500 pounds. The Pro MX EPS is available in Timberline Green or Bright White for $11,999. The Pro MX EPS LE comes in Firecracker Red for $12,499. The camo model is $12,649. All models have a three-year warranty. 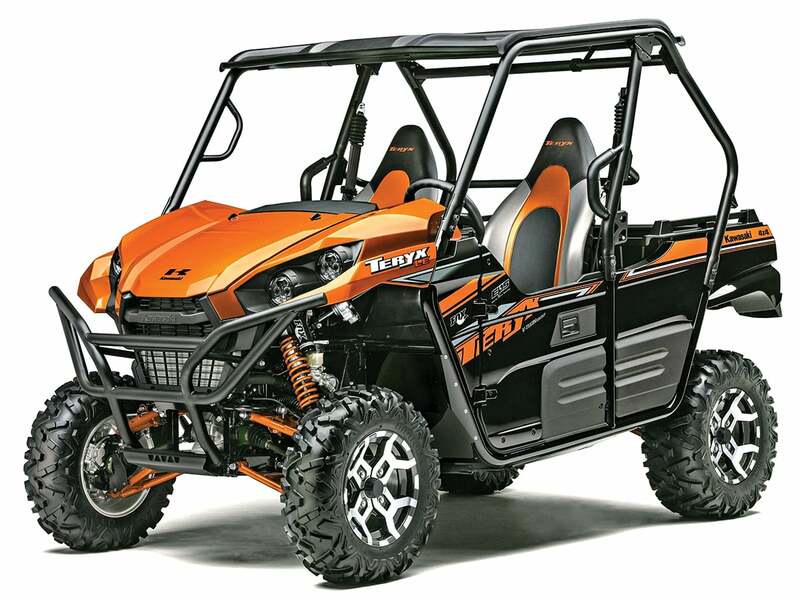 The sporty 2019 Teryx and four-seat Teryx4 return with new color choices but no mechanical changes. 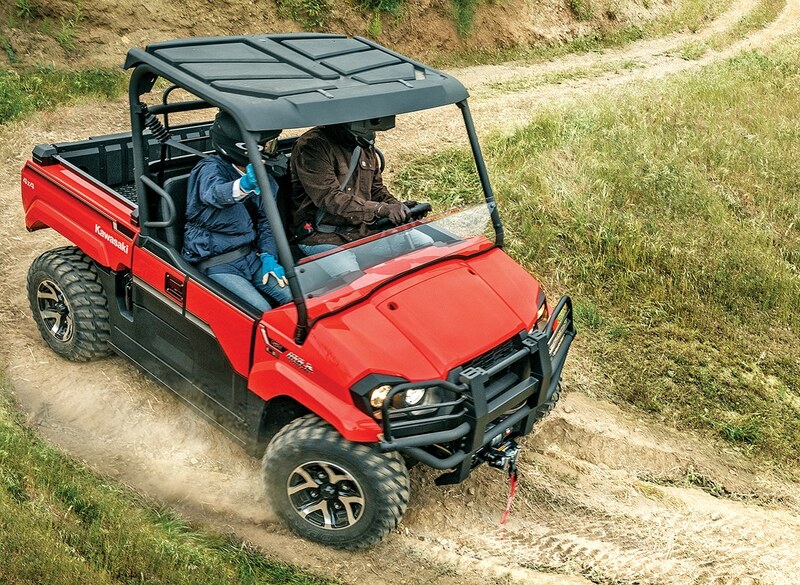 Teryx UTVs are powered by a 783cc, single-overhead-cam, eight-valve V-twin with a fully automatic transmission. The 4WD system has selectable 2WD/4WD with a locking front differential. These machines have double-A-arm front and rear suspension with 8 inches of travel up front and 8.3 inches in the rear using Fox 2.0 piggyback reservoir shocks. 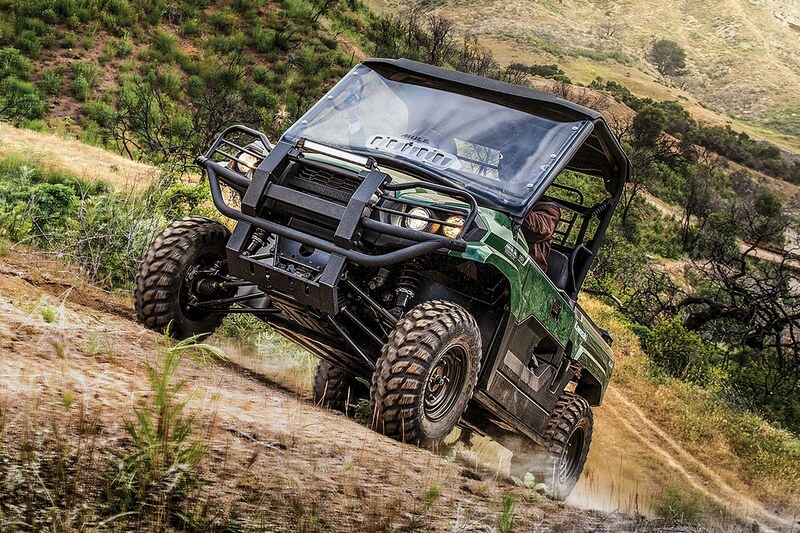 The Teryx and Teryx4 are available in base, camo and LE models, and all models have power steering. The LEs have Candy Steel Furnace Orange- or Matrix Camo Gray-painted bodywork, aluminum wheels, two-tone seats, and a roof. Camo models have a roof and steel wheels. Base models have Bright White bodywork, steel wheels and no roof. Teryx prices range from $12,999 to $15,199. Teryx4s go from $15,799 to $16,999. Mules, the Pro-MX’s tilting cargo bed has a flat steel floor. The bed can carry 699 pounds. 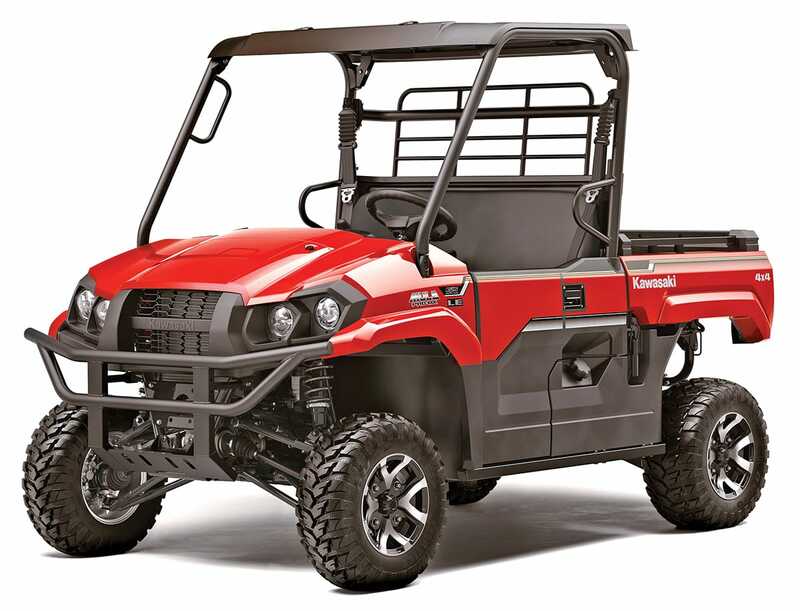 Kawasaki’s Mule Pro family of 64 inch wide recreation utility UTVs gets new colors choices but no mechanical changes. The Mule Pro-FXR is shortest lightest, and sportiest of the group. The Mule Pro-FX seats three and has a bed big enough to fit a full-size pallet. Mule Pro-FXT models are two-row vehicles that seat six and easily transform to a single row with additional cargo storage. 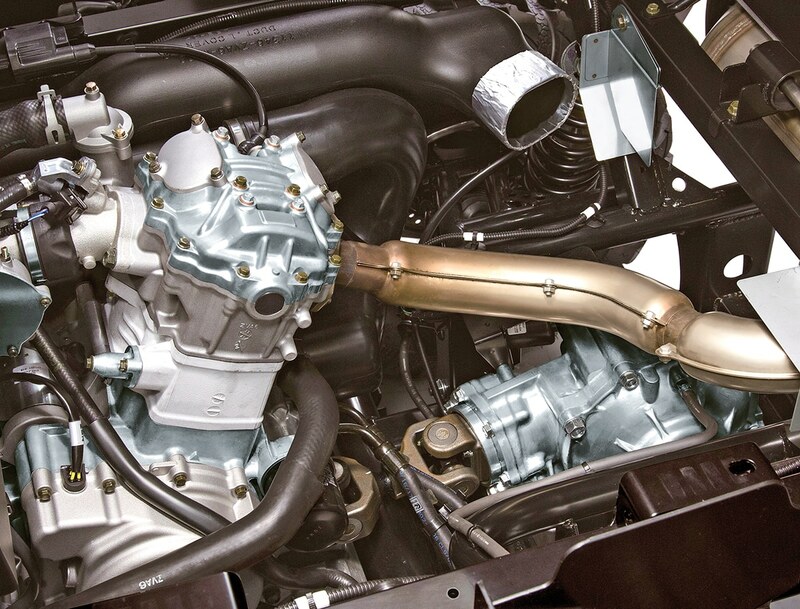 Mule Pro FXR, FX and FXT models are powered by a three cylinder, 812cc, double overhead cam, 12 valve engine. FX and FXT models are available in base, EPS, EPS LE and EPS camo versions. The FXT is also available in a Ranch Edition. The 2019 Mule Pro FXR is available in Candy Plasma Blue or Atomic Silver for $14,999. FX models start at $12,099 and range to $14,299. FXTs begin at $13,099 and go to $16,999 for the Ranch Edition in new Metallic Rustic Bronze.